Two intensely powerful and beautiful guided meditations from Dr Stephanie Dowrick are combined with the inspirational gospel-style music of singer-composer Tony Backhouse to create a unique inner experience of joy, consolation and hope. The first meditation is an invitation to grace; the second, an invitation to courage. Also included are three complete songs from Tony and a short daily meditation practice – Come Home to your Heart – from Stephanie Dowrick. This is an ideal CD for people in crisis, or those who need and want support in finding peace and greater confidence within. 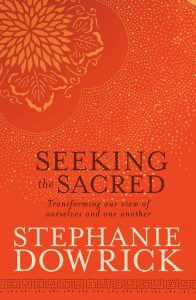 Like all the meditation CDs from Stephanie Dowrick, this can be purchased direct from Stephanie’s on-line bookstore.